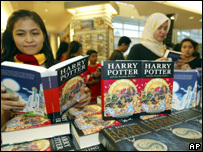 The Harry Potter novels are the UK's most re-read books, a survey suggests. JK Rowling's hit series beat JRR Tolkien's The Lord of the Rings and Jane Austen's Pride and Prejudice into second and third place respectively. The survey of 2,034 people, conducted to mark the 2007 Costa Book Awards, found 77% of UK readers re-read books. Other top 20 re-visited reads include Tolkien's The Hobbit, Charlotte Bronte's Jane Eyre, Dan Brown's The Da Vinci Code and the Bible. The research also showed that 43% admitted to deciding whether they will finish a book after only the first chapter. "The public want instant gratification and there has never been a more important time to remind the reading public not to judge a book by its cover," said literary agent Simon Trewin. The survey also found that almost a fifth of readers read their favourite book more than five times. The Costa Book Awards, formerly known as the Whitbread Book Awards, recognise the best of contemporary literature. The shortlist for the five categories - first novel, novel, biography, poetry and children's book - will be announced on 21 November. Stef Penney won the 2006 book of the year prize for her debut novel, the Tenderness of Wolves.